Speaking of causal modeling, as we were in a recent post, Econometric Theory is doing a special issue on Haavelmo. (This is not new information, but hey, I'm usually slow to notice things, and perhaps you are too.) Should be a fine issue, with many fascinating papers, including Heckman-Pinto. I list some of them below, from ET's "First View" page. There's a lot to like about MHE. It's an insightful and fun treatment of micro-econometric regression-based causal effect estimation -- basically how to (try to) tease causal information from least-squares regressions fit to observational micro data. It's filled with wisdom, exploring many subtleties and nuances. In many ways it's written not for students at age 23, but rather for seasoned researchers at age 53. And it tells its story in a marvelously engaging conversational style. But there's also a lot not to like about MHE. The problem isn't what it includes, but rather what it excludes. Starting with its title and continuing throughout, MHE promotes its corner of applied econometrics as all of applied econometrics, or at least all of the "mostly harmless" part (whatever that means). Hence it effectively condemns much of the rest as "harmful," and sentences it to death by neglect. It gives the silent treatment, for example, to anything structural -- whether micro-econometric or macro-econometric -- and anything involving time series. And in the rare instances when silence is briefly broken, we're treated to gems like "serial correlation [until recently was] Somebody Else's Problem, specifically the unfortunate souls who make their living out of time series data (macroeconomists, for example)" (pp. 315-316). All told, Mostly Harmless Econometrics: An Empiricist's Companion is neither "mostly harmless" nor an "empiricist's companion." 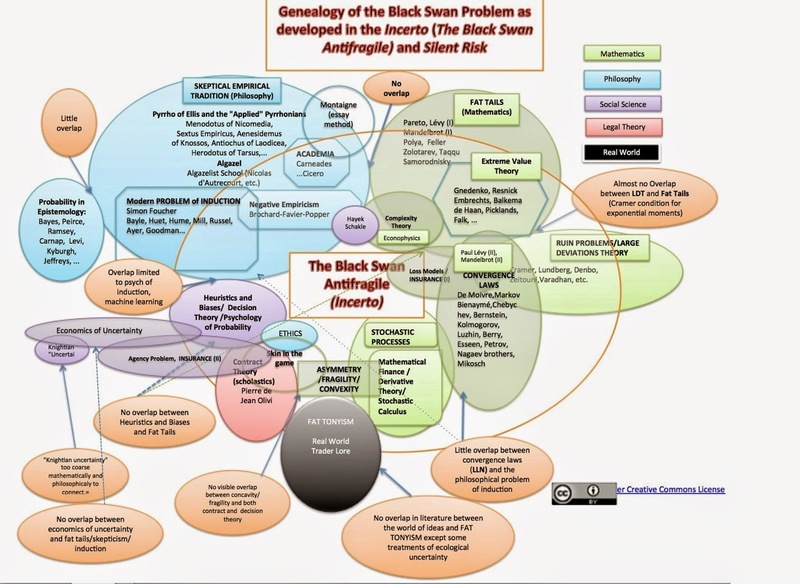 Rather, it's a companion for a highly-specialized group of applied non-structural micro-econometricians hoping to estimate causal effects using non-experimental data and largely-static, linear, regression-based methods. It's a novel treatment of that sub-sub-sub-area of applied econometrics, but pretending to be anything more is most definitely harmful, particularly to students, who have no way to recognize the charade as a charade. For friends in the area: We have been informed of more sad Klein news. Sonia Edith Adelson. January 8, 2015, of Gladwyne, PA. Wife of the late Lawrence Klein. Mother of Hannah Klein, Rebecca (James) Klein Kennedy, Rachel (Lyle) Klein, and Jonathan (Blandina) Klein. Also survived by seven grandchildren and four great-grandchildren. Services and interment will be private. Relatives and friends are invited to the late residence (Waverly Heights) Sat. January 10, 1-4 p.m and Sun. January 11, 1-4 p.m. The family requests that contributions in her memory be made to the Touro Synagogue Foundation - Newport, Rhode Island. 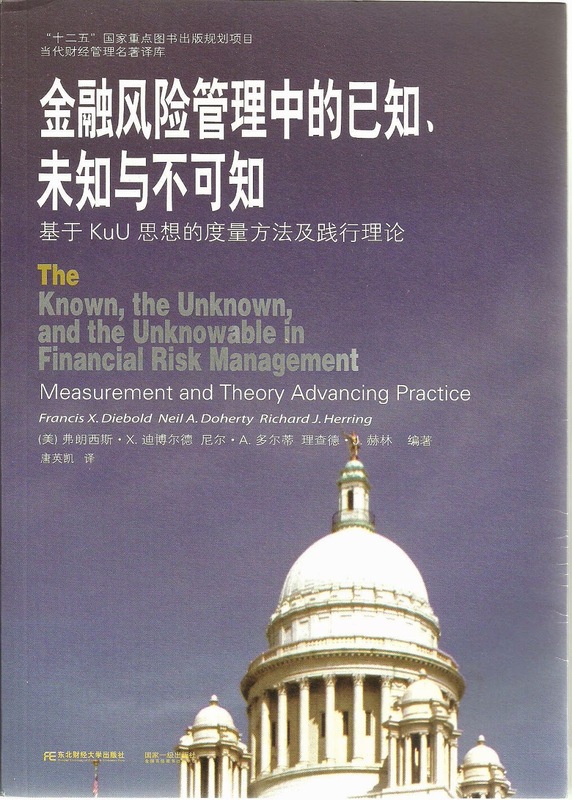 A Chinese version of the Diebold-Doherty-Herring risk management book just appeared. Interesting surprise. 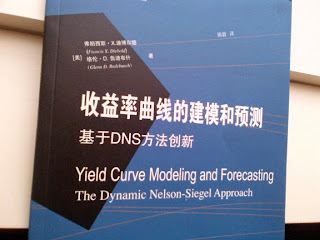 I knew nothing about it until it arrived in the snail mail, just as with the earlier Chinese version of the Diebold-Rudebusch yield curve book. Ya gotta love Princeton University Press. They take care of business, with minimal hassle.